As I spoke with Latinos throughout the weekend, I felt that something is different: a consciousness of our growing political clout is just starting to settle in after November. Hispanics voting in historic numbers formed the key component of the coalition that delivered re-election to President Obama. But the magnitude of what we accomplished is only now sinking in. 25% of public school students are Latino. 50,000 of our youngsters turn 18 each month, according to the Pew Hispanic Center. You don't need Ernst & Young accountants crunching the numbers to realize that Election 2012 was only a dress rehearsal for the political changes to come. No political party will be able to capture the White House--and key state governor mansions--without outreach to Latino voters that connects face to face, with actions that match words. Conservative Hispanics working on the Romney campaign were not listened to--I'm talking about the young guns who "get" where our country is and where it's going, not the tired ol' recycled goods from campaigns past. Arrogance and just total cluelessness about demographic reality and real people never add up to a win. Ask John Kerry who lost the Latino vote to George W. Bush and the election in 2004. The Hispanics with whom I spoke know they have shifted the political tectonic plates. They are emboldened and are going to give the President a chance to push immigration reform so that he can sign legislation into law. But there's a sense that he's been put on a deadline. And not just on this issue: community advocates are demanding Latinos in Mr. Obama's cabinet as I wrote at the beginning of January in "President Obama's Missing Senior Latino Administration." Don't believe me? 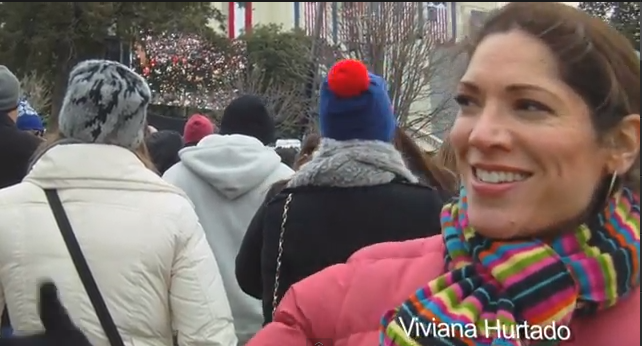 Hear for yourself in this video shot by IT intern Margery Waithaka on Inauguration Day, January 21, 2013. What do you expect from President Obama and why?